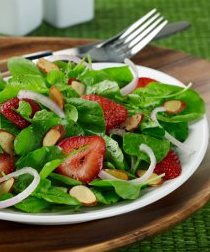 Place watercress, strawberries, almonds and shallots in a large salad bowl. In a small bowl, whisk together vinegar, honey and salt; whisk in olive oil until smooth and uniform. Pour vinaigrette over salad and toss gently. Serve immediately.